For nearly 30 years, Euro Lamellé has been manufacturing made-toorder glued wooden elements for wooden constructions. In line with its investment policies and to provide an increasingly superior service to its professional customers, the company has recently invested in a cutting centre that offers genuine state-of-the-art quality. For nearly 30 years, Euro Lamellé has been manufacturing made-to-order glued wooden elements for wooden constructions. In line with its investment policies and to provide an increasingly superior service to its professional customers, the company has recently invested in a cutting centre that offers genuine state-of-the-art quality. Founded in 1989, the Euro Lamellé company has grown constantly by following a continuous policy of investment in both materials and human resources aimed at product innovation and performance. 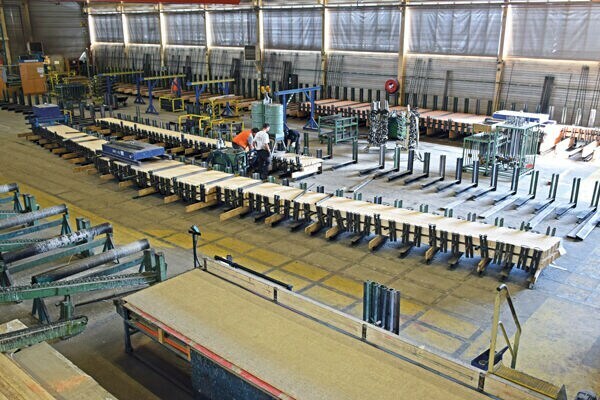 Euro Lamellé is specialised in the production of made-to-measure lamellar wood beams and stan¬dard lamellar and reconstituted solid wood products, like added value floor beams and fittings. From 10,000 m³ in 1998, today the company’s production volume has reached 30,000 m³. Its commitment to high quality manufacturing is shown by its numerous certifications, like the German Din standard in 1995, Acerbois Glulam in 1996, the Japanese JAS standard in 1999, and the Bois de Alpes and BQS in 2011. Euro Lamellé has also been involved in numerous benchmark projects, like the Refuge du Goûter and the Bellegarde TGV station. This level of success is also the result of a close and long-lasting relationship with its customers that is based firmly on trust and reliability. Today the company boasts a taskforce of 60 employees at its factory in Rumilly, thirty of whom operate in its workshop. There it continues to develop its 100% French products with its partners, by focusing on manufacturing and leaving design and installation to its customers. Euro Lamellé operates mainly with four types of wood from certified sources in responsibly managed forests, including spruce, Douglas fir, pine and larch in all standard sizes as well as made-to-measure lengths of up to 40 m. In its workshops, it cuts, drills, treats and finishes its products, providing its customers with ready to install wooden elements and all the corresponding hinges, boxes and hardware. The wood comes mainly from Sweden, Finland, France and Norway for the spruce and pine, from France for the Douglas fir and Austria for the larch. Bit by bit and thanks to its partnerships with a number of local sawmills, the company is increasing its use of local woods to. In the face of the fierce international competition in standardised lamellar wood and reconstituted solid wood products, Euro Lamellé has chosen to maximise the added value of its production. For many years, in fact, in addition to its classic range, the company also offers custom-cutting operations with a madeto-measure approach right from the start of production. When the strips are glued, in fact, the beams are positioned nearly in their definitive format in order to reduce rejects and optimize the use of the wood. 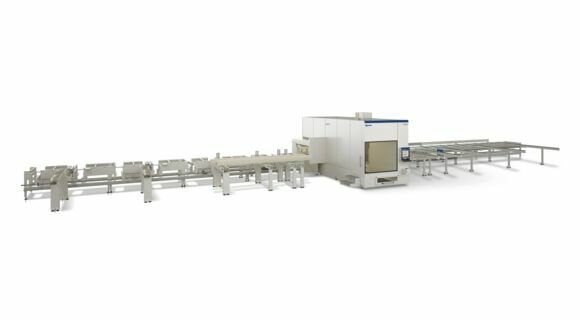 At the beginning of 2017, Euro Lamellé also added an internal cutting service, thanks to an investment in an SCM oikos 6-axes CNC machining centre. 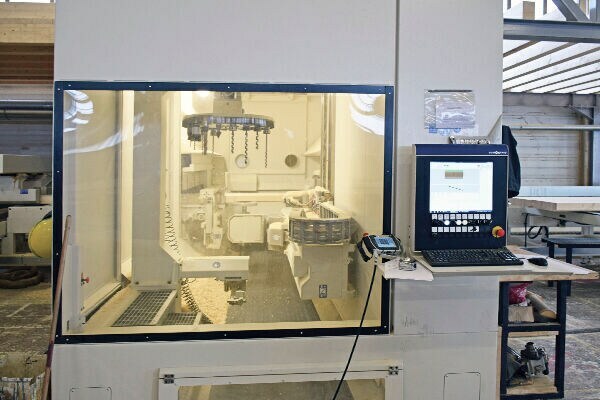 Fitted with a 15-position tool changeover system, this machining centre includes a chain-driven router and saw that can process any straight workpiece measuring up to 1.25 m wide and 19 m long. This has allowed Euro Lamellé to achieve estimated an annual cutting production figure of no less than 3,000 m³, plus a further 1,500 m³ of wood that is still cut by hand. Together, this is equivalent to 15% of the company’s overall production, while the rest consists of customised cutting operations. Thanks to this recent investment, the company’s current goal is to increase its on-site processing quota that is a byword for added value and service.